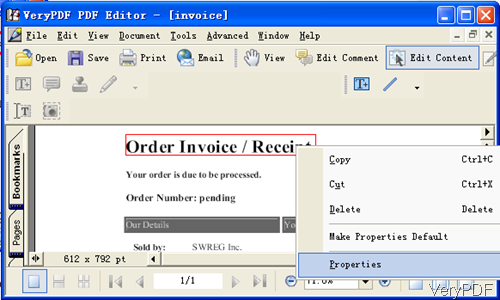 Question:Hi, I have VeryPDF PDF Editor. How do I yellow highlight text? It's very easy in Adobe, I just drag the yellow marker through the text. Also, I get many PDF files that don't allow any kind of editing. How can this be circumvented? I want to highlight and apply sticky notes. Answer: VeryPDF PDF Editor does have the function of highlight text in PDF file. And it is very easy to process. So I guess there are some wrong operations. And when highlight text in text based PDF file, please refer to this article. When high text in image PDF, please refer to next article. As to how to judge image PDF and text PDF, please use this method. Please try to do copy and paste in PDF file. 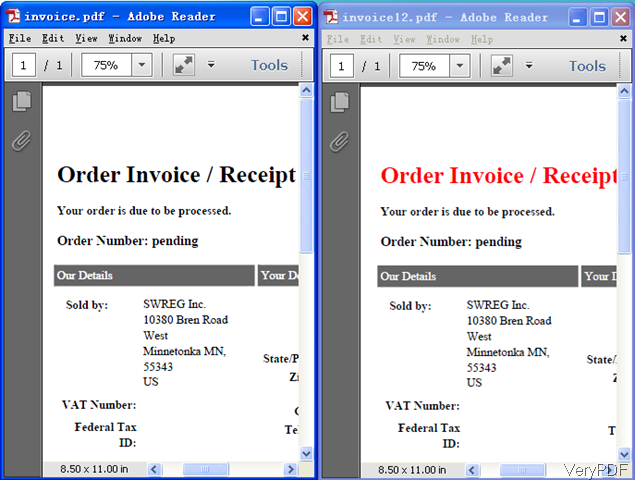 If you can copy text in PDF reader, it is text based PDF file. Or else it is image PDF. Once downloading finishes, there will be an exe file in the downloading folder. Please double click the exe and follow installation message, a few seconds later, PDF Editor will be installed. Once it is installed, there will be an icon on the desktop. Simply click the icon then you can launch this software. 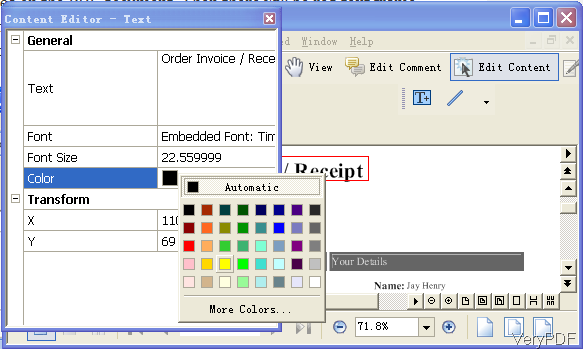 The following snapshot is from the software interface. Please click option Open to add PDF file to software interface. And this software supports all version PDF files. 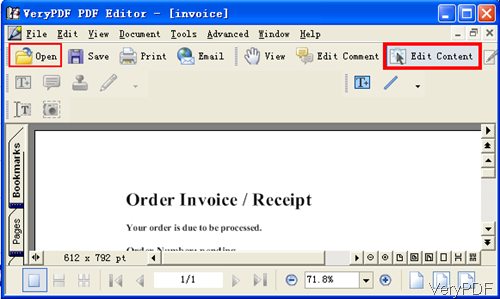 Please click option Edit Content then you can click any area on the PDF document. Then there will be red text frame showing around the text. Please right click the red text frame and there will be drop download list where there is an option named Properties. Please click that option. This step can be illustrated by the following snapshot. When you click option Properties then you will see the following menu option. There is an option of color, please click it then there will be more color options where you can set the highlight text color according to your need. Meanwhile if you need to change the content, please change it in the Text part. If you need to change font style, please change it in Font. If you need to change the font position, please change it in Transform blank. Now let us check the highlight text in PDF effect from the following snapshot. If you need to use this software forever with watermark, please pay for it. During the using, if you have any question, please contact us as soon as possible. How to highlight keywords in PDF pages? Searching and Marking Multiple Words in a PDF. Highlighting Multiple Words in a PDF Document using PDF Highlighter Command Line. How to automatically highlight keywords in the PDF text contents? 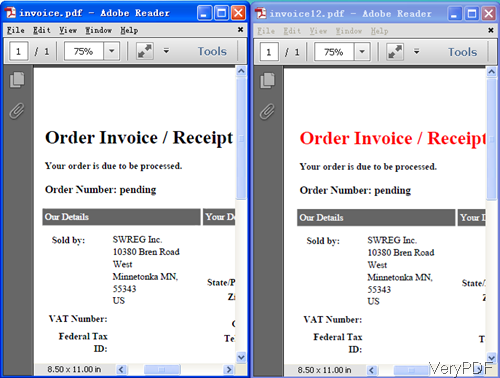 Highlight, Underline, and Cross Out text in pdf documents. Convert keywords to clickable hyperlinks. How to highlight PDF by command line in batch? How to highlight text in PDF? How to highlight text in image or image PDF? How to encrypt PDF by PDF Editor? Can I paint in PDF document? This entry was posted in PDF Editor and tagged highlight text. Bookmark the permalink.